Over 100,000 people have been evacuated from the danger zone around Bali’s threatening Gunung Agung, an active volcano that last erupted in 1963. That eruption killed 1500 people and you’ll still see the lava flows if you drive out to the eastern side of Bali. I climbed Mt Agung in 2012 – a car took me from Ubud to the starting point of the climb, my guide and I started out after midnight and got to the top around dawn. 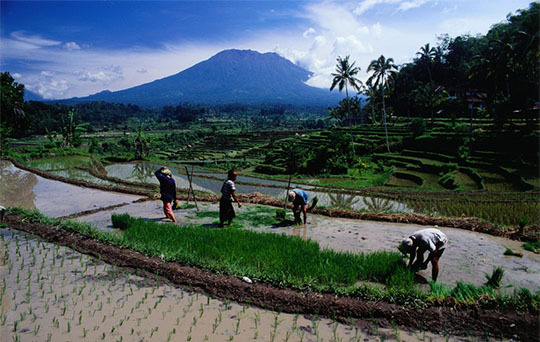 ▲ Agung has often been a backdrop to Bali visits, photographer Richard I’Anson deliberately focused in on Agung as a rice paddy backdrop for our 2004 coffee table book Rice Trails. ▲ In 2016 I was back in Bali for the Ubud Writers Festival and I spent a couple of days before the festival diving on the wreck of the Liberty off Tulamben on the east coast of Bali. 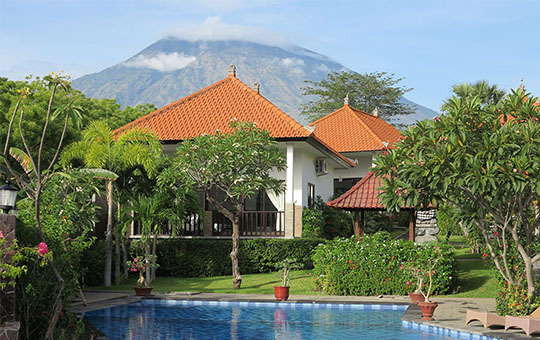 From my hotel Agung seemed to loom up only a stone’s throw beyond the swimming pool! I’ve climbed lots of other volcanoes – active and dormant – over the years, Kilimanjaro (5896 metres, 2007)) the highest of the lot. Mt Fuji (3776 metres, 1990) in Japan would have to be the most popular volcano climb in the world. I’ve never been more exhausted climbing something than I was when I got to the top of the Philippines’ Mayon Volcano (2463 metres) in 1977. It’s still very active and has erupted numerous times since my visit, the 1993 eruptions killed 75 people. ▲ Tavurvur, Kabiu (The Mother), Turagunan (South Daughter) on Rabaul Harbour when I was there in 2012. I climbed Tavurvur and walked around the rim in 1978, working on the very first edition of Lonely Planet’s Papua New Guinea guidebook. In 1994 a huge eruption pretty much submerged the beautiful town of Rabaul in volcanic ash. Although the Rabaul Hotel was dug out, reopened for business and I stayed there in 2012 the town has virtually shut down and everything has shifted along the coast to Kokopo. 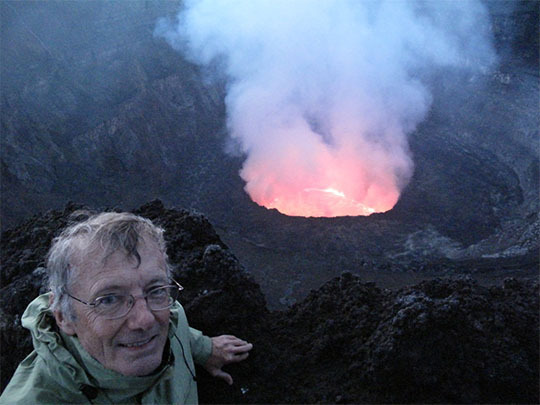 Tavurvur erupted spectacularly again in 2014.